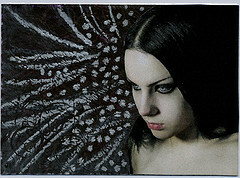 I made another monochrom Alice ATC, for a trade over at ATCs for All. I´m actually so happy about my Alice monochromes, I´d like to make them into prints, but I don´t know if there is anyone here that does that. And I do need to send them any day. Well, I still have photos, even when they are gone, maybe I´ll make new ones later. 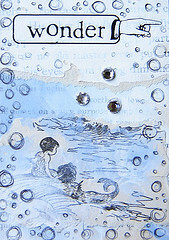 I think I´ll do a blue flamingo next, and that may be the last one of the monochrome Alice´s. Our horse is well again, fortunately, they went back home yesterday, after having him at the horse clinic for five days or so. It´s worse off with me - I, as well as my sister, nephew, brother-in-law, got the flu while they were here, at least I think it was the flu - like a cold, but worse. So now I´m caughing, sniffling and sneezing, and I spend all of yesterday in bed with a fever, and aching all over. The good thing about stomach flu, is that they´re gone after a day, this feels like it could last for a while. 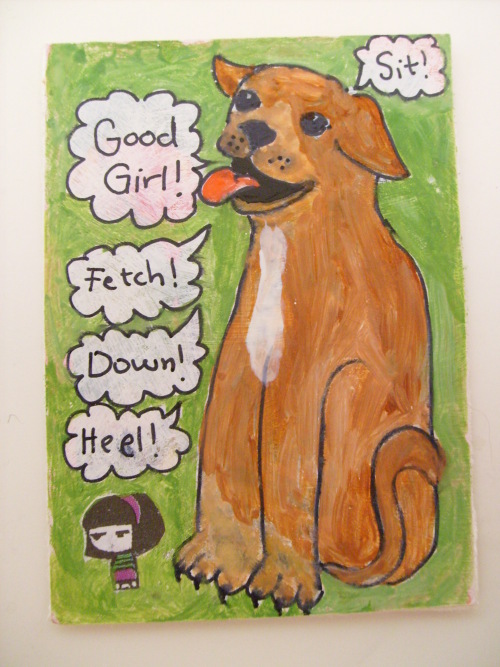 Enough self pity - I have only been doing ATCs for a very short time, and already someone wants to do a trade! Yay! 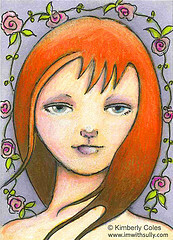 The last two are for an ATC swap over at flickr, can you tell I love Alice in Wonderland? 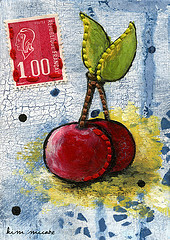 I got a book too, yesterday, "Artist trading card workshop", and got some inspiration there, even though I´d like a more basic book - this felt like a book for the artist who has explored the more usual ways to make ATCs, and who want to take one step further with some more unusual techniques. 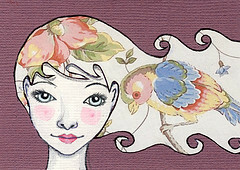 I am in search of a good, nice looking ATC album, and was going to get one on etsy, but that has already been sold. 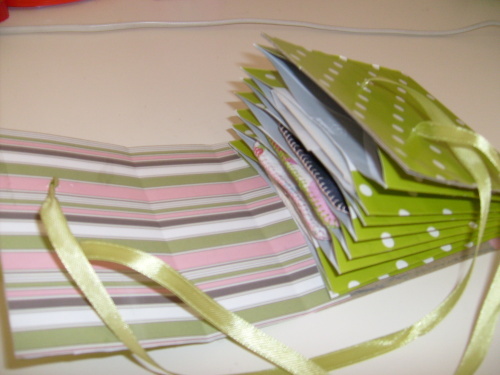 So I made a little something last night, It doesn´t hold enough cards, but it´s a start. 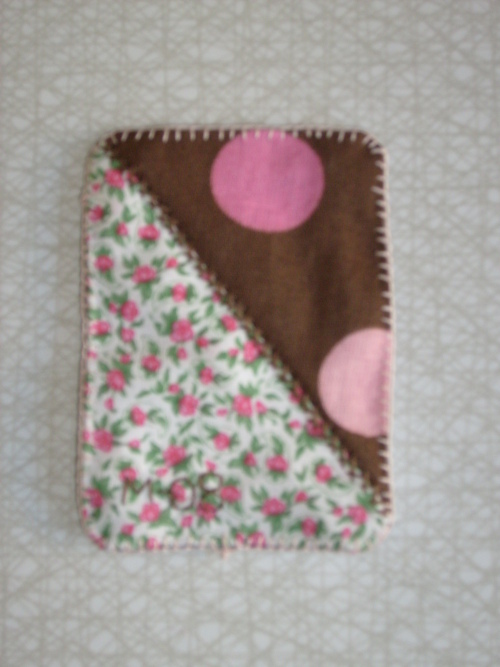 While I was making it, I thought it looked like crap, and I almost threw it away, but now I´m happy I didn´t! Last night, I ran between the TV (yay for commercial breaks!) 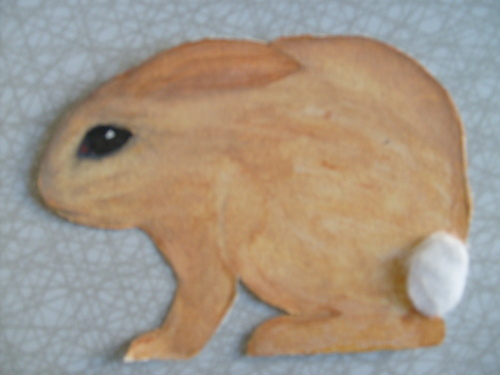 and my art cards, finishing the one I started the night before, and making another one, a die cut bunny. I am actually surpriced how well they turn out, since I´m really new at this, and I do find it harder to find inspiration when it comes to paper crafts (or dare I say it - art). But I get ideas when I work on them, so I guess it´s true what they say about inspiration. That it takes perspiration. Our horse is a bit better, and bad things can bring good ones as well - my father and sister with boyfriend came to stay here while the horse is at the clinic, so we got a surprise visit, and a very welcome one. Another good thing - my camera is fixed, and I´m getting it from the shop later today, whoohoo! 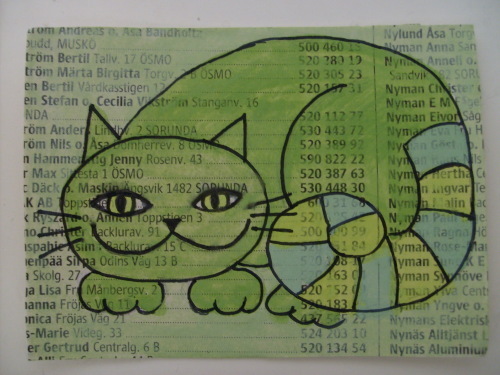 I´m also buying a book, maybe two, about ATCs and ACEOs, I do need some inspiration at hand at home, I´m so completely new to this whole collage thing, and I could use some hints on painting and drawing as well, and don´t even get me starting on printing! Deep water! They have all been shipped, so hopefully I´ll have them next week! 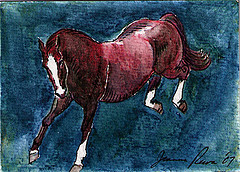 My family has a horse, Krysset, we´ve had him for almost eleven years, and he´s the greatest horse I´ve ever met. And now he´s really ill, they had to take him 700 km, to the horse clinic, late last night. And they still don´t know what´s wrong with him, or if they can fix it. I so hope that thy can make him better, I don´t know how life would be like without him (even though I only see him once or twice every year). If you have some thoughts, or prayers, or just a crossed finger or two, please send them his way. 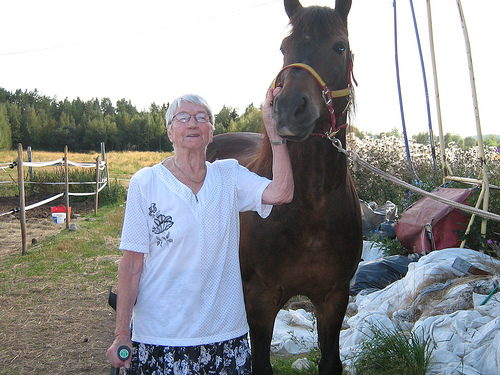 And while you´re at it, do send some towards my granny as well, she´s 92½, and has not been well lately. I hope they both get well soon! When I got home yesterday (with some freshly bought paper and stuff), I got to work. 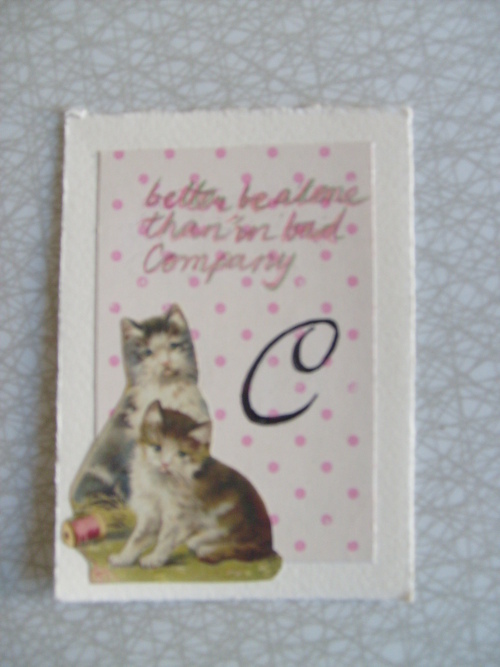 First I finished the fabric ACEO I had begun cutting out (it became purple/black with a big piece of chocolate cake and a cream button on top, quite nice, actually), then I made one ATC in paper, I collaged some and wrote some, and then I got halfway done with another paper ATC. So 2½ in one night! That´s what I call creative! 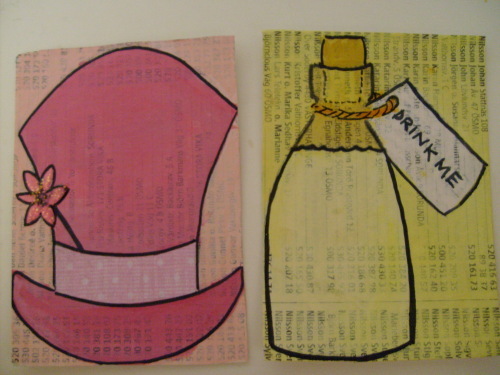 Especially since paper is definitely not my medium, I´m more in to fabric and yarn. 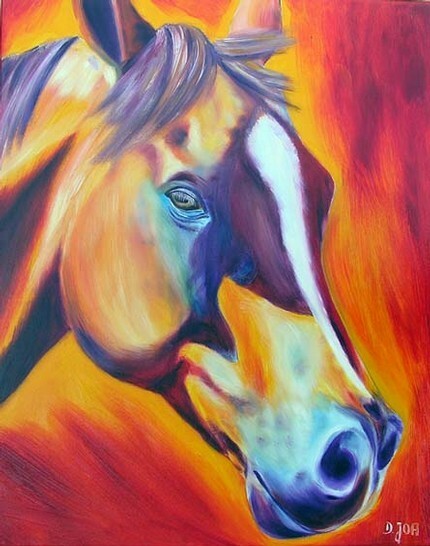 But I did draw and paint some in my teens, I guess it´s about time to remember some old skills. 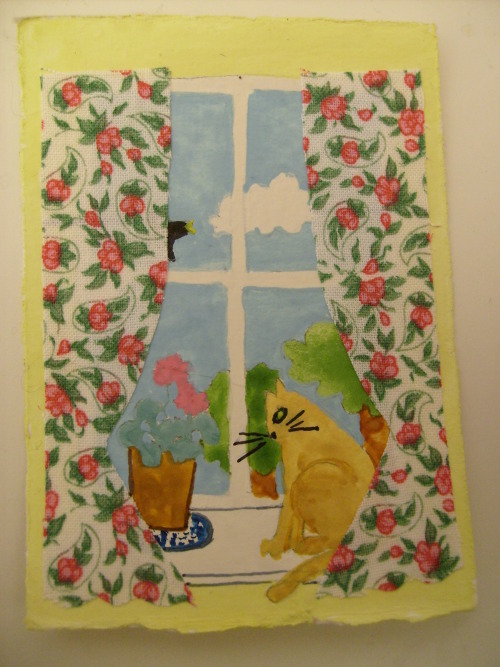 I hasn´t been happening much on the ACEO front lately, I have an idea for an ACEO, I have even cut out the fabric for the front, but I haven´t gotten around to it. 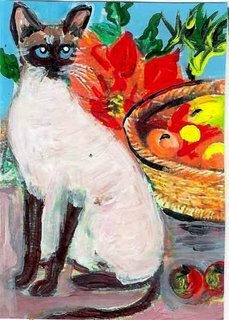 I guess I just needed some inspiration - I´ve been cruising ACEOs/ATCs on the net, and I really want to get home and get to work. 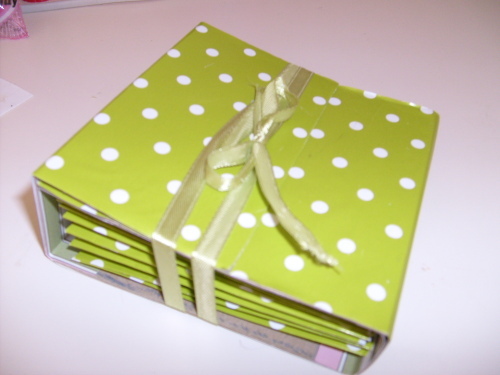 I also want to try making some in paper, I want to buy and swap, and I feel the need for an album to keep them in. You know I don´t do things half way! 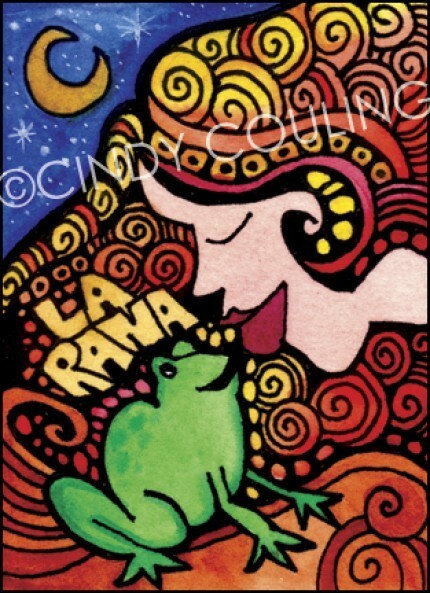 I found a very nice album on Etsy, I´m pretty sure I´ll end up buying that one. Making one myself would be great too! 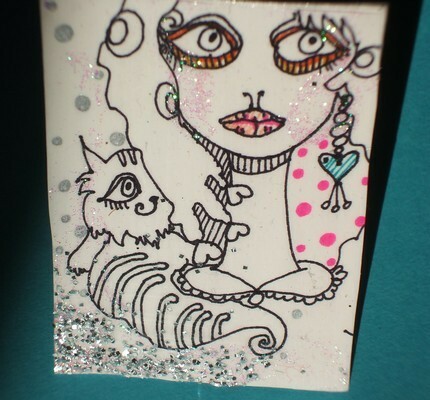 And do go look at flickr and etsy for ATCs and ACEOs, thay are beautiful, and really inspiring! 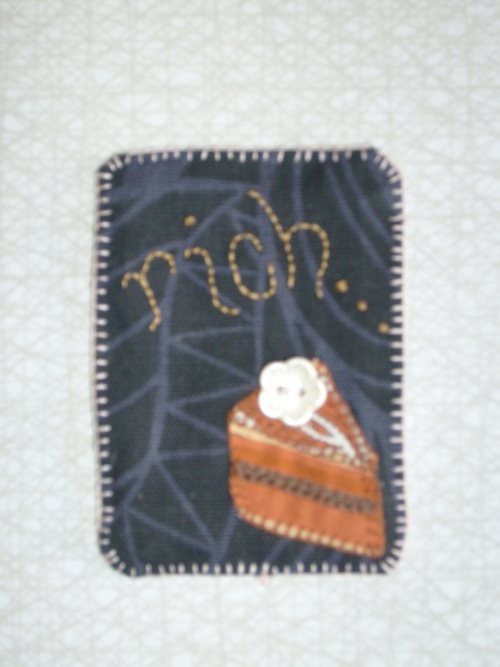 I have just sold my pile of Japanese craft books, and got about 160 USD, not bad I think. I want to buy one, maybe two, or perhaps all three of these. Or I´ll get one, and some other things (hmmm, maybe food...) for my flat. I love online auktions! but now it´s here! 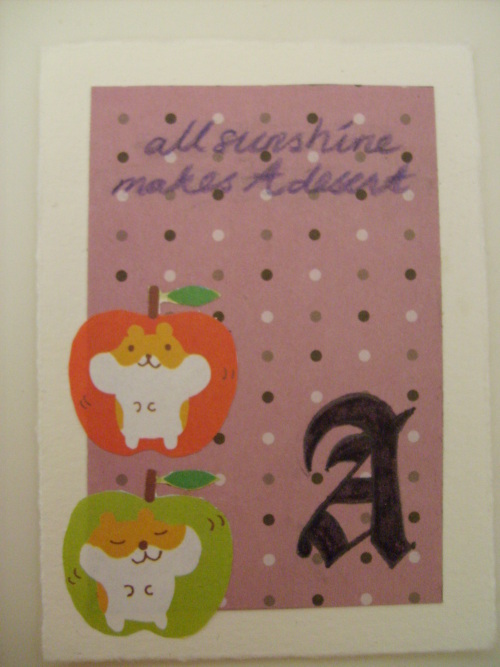 I got my package from Charlene in Singapore today, and it was so lovely! 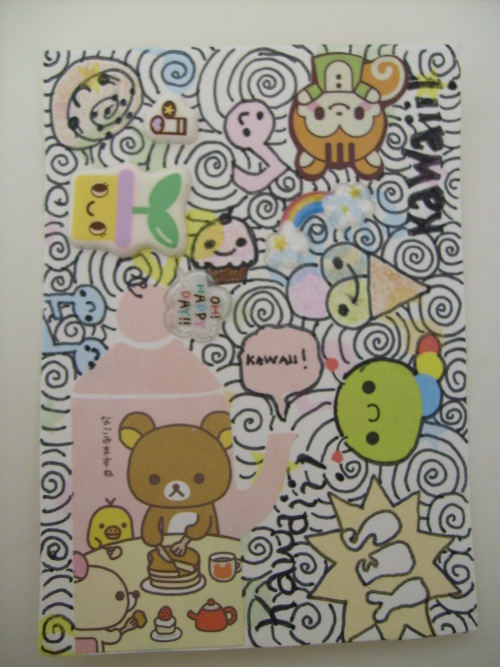 I haven´t done very much kawaii lately, but her package really hit home, everything was so perfect! I got: a San-X frog bento (it´s green! 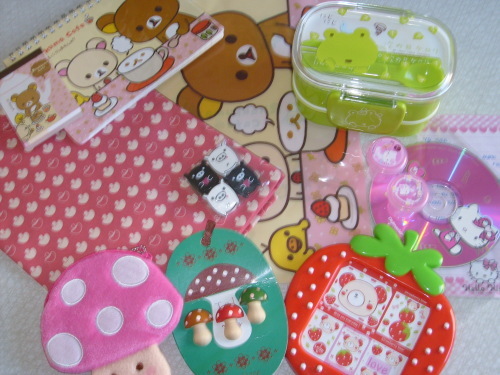 I love getting bentos that aren´t pink, because I´ve got so many pink ones), a strawberry photo frame, a Rilakkuma Café file holder, memo pad and notebook, Hello Kitty condiment containers and recordable CD, mushroom fabric, pins and purs and Monokuro Boo paper clips. Everything´s on my "I love"-list, and I can´t wait to get home, and really start going through it all! 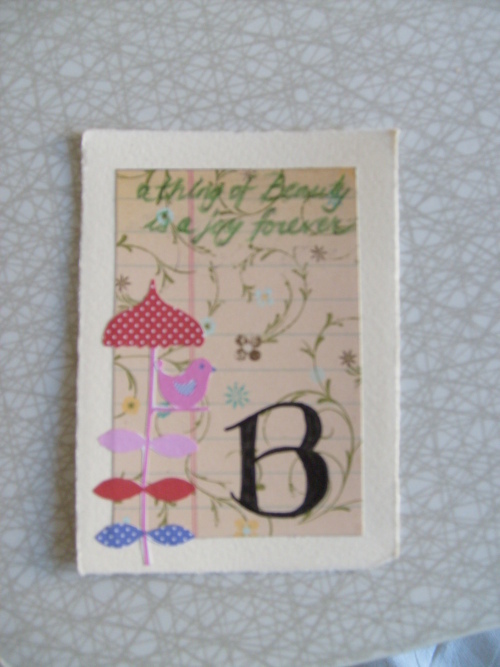 Thank you so much, Charlene, I love it! I feel so spoiled, in the best possible way! I got a swap package yesterday, from Iris in England. It was our second swap, and when I opened the package I was reminded why we did another one: she puts together amazing packages! I got two hanks of white liks yarn, one hank of HipKnits sock yarn (lovely colours, can´t wait to see it on my feet! 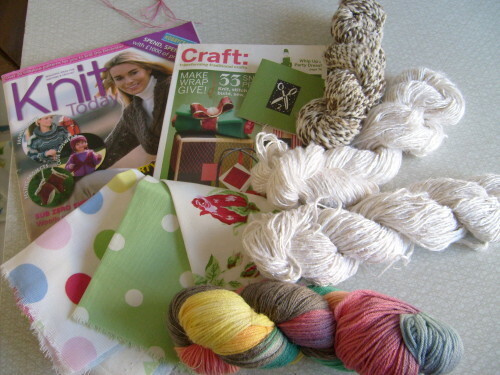 ), a hank of homespun brown/white yarn, a knitting magazin, a Craft: magazine, some Cath Kidston fabric and very delicious chocolate. I felt spoiled like a princess, and loved everything! Thank you so much, Iris! I have put up a pile of my Japanese craft books on Swedish Tradera, I kept my favourites and decided to sell the rest. Why, you might ask. Well, I found some other Japanese books I´d rather have, so I feel it´s a fair trade. I hope I get them all sold, and soon, and expensive! One of my photos got on the Explore front page on flickr, yay! It´s the most traffic I have had on any of my photos, the most comments, and all in a couple of days! If I knew what I did right on that one, I´ll do it again, that´s for sure!